Jacketed Hopper is a job of Stainless Steel Fabrication container used to flow a bulk material such as tablets, capsules, medicine powder, ointment downward and can discharge its contents. A tapering container, working with a hopping motion, through which above material can be passed into a machine. 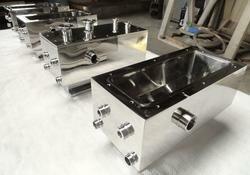 This is a customize job of SS Hopper made from a Stainless Steel sheet. Jacketed Hopper is generally fitted on top of the machines. Looking for Jacketed Hopper ?